Also known as collagen induction therapy or CIT, micro-needling is an aesthetic medical treatment used to improve skin appearance. It can reduce or remove fine lines, wrinkles and acne scars, and improve the skin’s texture, color and tone. 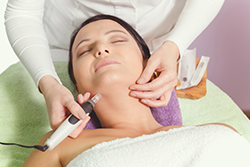 Micro-needling can be used on any part of the body. Most frequently, it is used on the face, neck, chest, arms, hands, legs, abdomen and back. Micro-needling is done with a device that looks somewhat like a pen. This pen contains a number of micro-needles in the tip that the practitioner uses to create “controlled micro-injuries” to the skin’s surface. This, in turn, stimulates the skin to naturally produce collagen and elastin. The skin’s repair process results in a thicker, softer epidermis. The process takes about an hour, and most patients experience little or no pain and only minor discomfort. Immediately after treatment, the skin area treated will be red, but this passes in 2–4 days, sometimes even less. The skin’s appearance will continue to improve for up to 6 months. Normally, it’s recommended that you receive 2 or 3 treatments, spaced 6–8 weeks apart.